The Philippines is one of the largest economies in the world and is the 8th most vulnerable to malware attacks in Asia. 146 million domain names were registered worldwide last year alone resulting in 10% increase in domain name disputes from 2016. The growing business community in the Philippines is prey to phishing, which costs on an average $ 3.7 million to a medium-size enterprise. With 9 out of 10 Filipinos vulnerable to phishing attacks, it is imperative to learn about the domain name dispute rules and procedures. 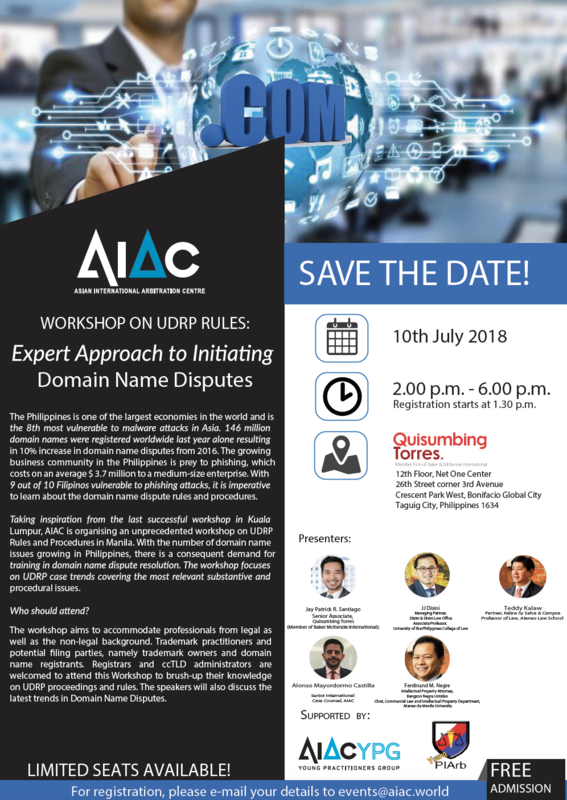 Taking inspiration from the last successful workshop in Kuala Lumpur, AIAC is organising an unprecedented workshop on UDRP Rules and Procedures in Manila. With the number of domain name issues growing in Philippines, there is a consequent demand for training in domain name dispute resolution. The workshop focuses on UDRP case trends covering the most relevant substantive and procedural issues. The workshop aims to accommodate professionals from legal as well as the non-legal background. Trademark practitioners and potential filing parties, namely trademark owners and domain name registrants. Registrars and ccTLD administrators are welcomed to attend the Workshop to brush-up their knowledge on UDRP proceedings and rules. Speakers will also discuss the latest trends in Domain Name Disputes. For registration, please e-mail your details to events@aiac.world. Admission is free with limited seats available.